It seems arguable (based on what has been reported in the press) that the business owner here has breached a number of laws. Whether or not the dismissed contractor, Madeline, will take legal action, it is worth noting this, in case others decide to take a similar approach to employees or contractors with whom they disagree on this issue. It has to be said, however, that the illegality of this action under the recent Federal legislation is not entirely clear. Section 15 of the Marriage Law Survey (Additional Safeguards) Act 2017 (the Safeguards Act) makes it unlawful for someone to vilify, intimidate or threaten to harm someone because of their views on the marriage law survey question, but somewhat surprisingly does not directly penalise the actual causing of harm to someone on that basis. Here, however, there seem to be a couple of ways in which an offence may have been committed. So it seems plausible to say that when a modern Australian Parliament enacts a law forbidding “vilification”, it probably intends to pick up this sort of meaning: that it refers to speech which incites hatred towards someone, or serious contempt for someone, or [revulsion] or severe ridicule of someone, on the basis of a protected characteristic. To come back to this case, then: does calling someone a “homophobe”, incite hatred or serious contempt or severe ridicule towards them? A court might find that this is the case, especially in the highly charged atmosphere of social media and the current debates over the survey. On the other hand, a court might find that in the interest of protecting the strong value of free speech, the word has perhaps become so common a canard thrown at opponents that it really does not rise to those serious levels any more. There seems to be a more direct route to illegality under the Safeguards Act here, though. Ms Sims goes out of her way at one point to say “this wasn’t a ‘you’re voting no, you’re fired’ situation”. Her meaning in light of subsequent comments about “prior conversations” seems to be that the contractor had been made aware of her concerns. If those concerns had the tone, however (and it seems they probably did), of “unless you remove that Facebook profile, you won’t be working for us any more”, then arguably at that point there was a breach of s 15 because there was a “threat to cause harm” (i.e. to cause a loss of income) on the basis of a view that had been expressed in respect of the marriage law survey question. 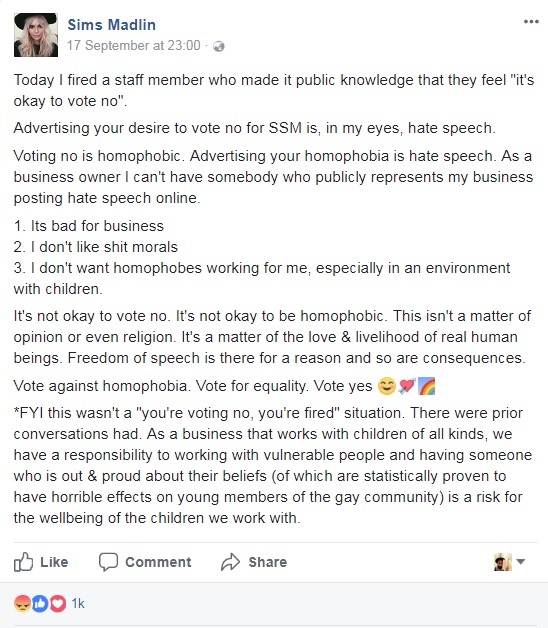 So if, in contrast to the above, nothing had been said about “homophobia”, and if no prior warning had been given, would the business owner here (or a future employer) be lawfully entitled to sack someone with no warning because of their views on the marriage law survey question? It is sufficient if the belief is one that ‘bears on government’ or involves the processes, policies or obligations of government. Since the Commonwealth Government has initiated the process of the survey, and plans to use it to decide its policy on changing the law of marriage, it seems clear that a firm view on the outcome of the survey is a “political conviction”. No relevant exemption seems applicable here- under s 45 workers for political parties may be hired or fired based on their political views, but it seems unlikely that this principle would apply to a children’s entertainment business. Hence it seems likely that the action of refusing to offer further work to a contractor based on their expression of a view about the survey vote, was unlawful discrimination under the ACT law. Illegality under other Federal law? There is also a question as to whether there has been a breach of the Commonwealth Fair Work Act 2009. Indeed, a recent press report indicates that the Fair Work Ombudsman is investigating this possibility: see “SSM: Fair Work Australia to investigate after Canberra contractor fired for backing No vote” (ABC News, 20 Sept 2017). However, it may be doubted whether there are any remedies under the FWA. The usual provisions governing employees would probably not apply to a short-term contractor: see s 351 (prohibition against discrimination by an employer) and the unfair dismissal provisions (ss383-384). There is a little-used provision of the FWA which was enacted based on Australia’s international law obligations, s 772, which is in Part 6-4, which “contains provisions to give effect, or further effect, to certain international agreements relating to discrimination and termination of employment” (s 769). Under s 772 it is unlawful for an employer to terminate an employee’s job for a range of reasons, including under s 772(1)(f) “political opinion”. But again, this applies to employees, but is not said to extend to contractors. In short, it seems likely (based on what has been reported) that this action was illegal under the Safeguards Act and also under local ACT discrimination law. Respectful debate on this important issue is not furthered by threats to harm others because of their views on the matter, where those views are not directly relevant to a person’s work. The issue that led to the matter being dropped was the “nature of the engagement”- in other words, it was not clear that Madeline was an “employee” as opposed to a contractor. I had already noted (above) that the Commonwealth laws would not apply to contractors. The FWO did not conclude that sacking someone because of their political views is acceptable. It did not investigate the probable breach of ACT discrimination law. It may be that the person concerned chose not to pursue remedies under that law. At any rate, the course of events should not embolden anyone to dismiss employees or contractors simply because they hold controversial views unrelated to their duties.